News about Virginia’s Community Colleges is spreading. Like many states, Virginia saw the financial wisdom of channeling more in-state students to community colleges for their first two years of higher education – rather than building or vastly expanding costlier four-year schools – by promising automatic transfers into its state universities with a minimum grade-point average. The result: Community-college graduates can even gain automatic entry into the University of Virginia in Charlottesville, one of the top public universities in the country. The program has proven especially valuable for underachieving high-school students who upon proving themselves capable in community college can complete their bachelor’s degree at state universities for which their high-school transcripts would have denied them access. And Mountain Empire Community College and Patrick Henry Community College were both mentioned in recent news stories about the Gates Foundation and their grants to help students complete college, due to their successes in the Lumina Foundation’s Achieving the Dream project. The Chronicle of Philanthropy commends MECC for “a strategy that works,” with a fast-paced remedial mathematics program resulting in a 60 percent pass rate, compared to 27 percent in standards classes. The Raleigh News & Observer noted that Achieving the Dream helps reduce dropout rates in remedial classes in PHCC as well. Gates Foundation funds will help the Achieving the Dream project continue. Meanwhile back in Virginia, the city of Roanoke’s guarantee of a free tuition at VWCC for city students with a grade point average of 2.0 is designed to boost high school graduation rates and give students an opportunity to begin a college career. Here’s VWCC President Bobby Sandel’s editorial blog on the topic published in the Roanoke Times. And other colleges are being noted for record enrollments this fall, including J. Sargeant Reynolds (Fox NEWS) and Wytheville Community College (Bland County Messenger) . New voters have been signing up “in droves” at a number of voter registration events held at Virginia’s Community Colleges, area newspapers report. 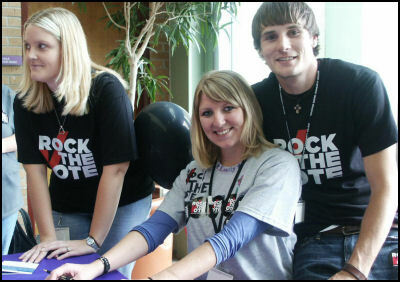 With Virginia expected to register more new voters than ever before this fall, Virginia Community Colleges have been the sites for a number of voter registration drive events at colleges. Community colleges have always been key in grass-roots election campaigns. When higher education bonds are on the agenda, as in 1992 and 2002, local networking through community colleges often pushes those measures over the top. The deadline to register to vote in Virginia is Monday, Oct. 6.